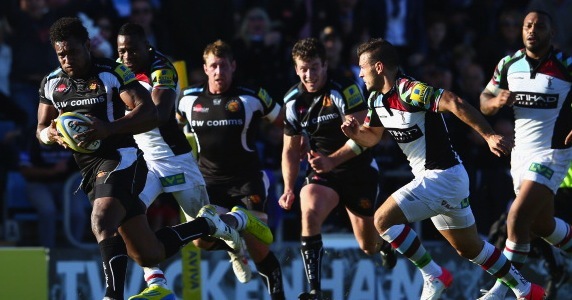 Can Exeter’s remarkable rise continue against Leinster? THIS TIME three years ago, Exeter were still in the RFU Championship, in the middle of a week that started by playing London Welsh at Sandy Park and finished with an away trip to Birmingham. Fast forward to the present and the Chiefs are in Dublin, taking on arguably the greatest European side of all time, Leinster. It is a script of some proportion. Traditionally teams promoted from the Championship with little experience of the top flight have headed straight back down, but Exeter have proved to be an exception to the rule. Finishing 20 points clear of relegation in 8th place after their first campaign, the rise continued last season with an impressive 5th place and with it a spot in this season’s blue chip tournament, the Heineken Cup. Defying all logic, Exeter have been welcomed into the Aviva Premiership due to a number of reasons. Their squad is not filled with international players such as Leicester or Northampton, but they are imbued with, arguably, the greatest spirit in the Premiership. Of the core group that won promotion back in 2009, many remain. There are cult figures such as captain Tommy Hayes, Chris Budgen, Richard Baxter and Phil Dollman, smatterings of international talent in Ignacio Mieres, Sireli Naqelevuki and Dean Mumm and now significantly, an England international in the outstanding blindside flanker Tom Johnson. Their support too has been exemplary. Not a weekend now passes without the sound of the Tomahawk Chop echoing around one of the Premiership’s grounds and the league is better for it. Sandy Park has become a fortress where teams have struggled, with Premiership champions Harlequins the latest to fall last weekend in a 70 point thriller. Taking on Leinster will be another step up, but Exeter will run out at the RDS with no fear. Competing with Europe’s elite begins an important new chapter in the history of the club, and one that according to Hayes they will thoroughly enjoy.